The availability of Cortana, the Microsoft’s answer to Apple Siri and Google Now intelligent personal assistant, is still limited. Cortana is currently only available on Windows 10 for the United States, United Kingdom, China, France, Italy, Germany and Spain. 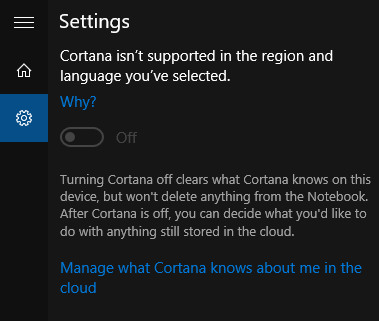 Cortana isn’t supported in the region and language you’ve selected. Though the list of regions and languages supported by Cortana may be quickly expand in the near future, here’s the workaround which allows you to enable the Cortana in Windows 10 selected with unsupported region and language. The trick is essentially to configure Windows 10 to match the Cortana’s supported region and language to get Cortana working. 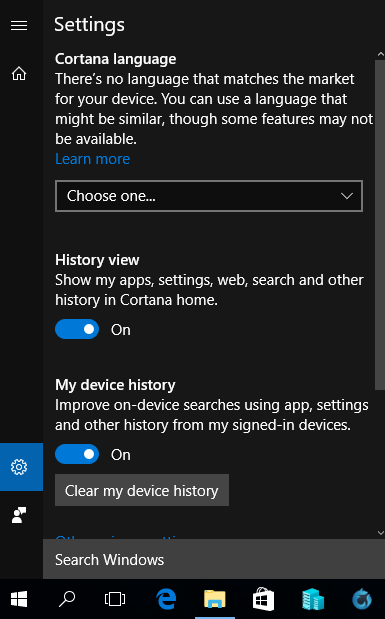 Beginning from Windows 10 Version 1607 (Anniversary Update), you can enable Cortana by specifying a Cortana language without changing region even though the device is in unsupported region. To select Cortana region, click or tap on the Search icon or Search box, and go to Settings (gear icon). Under Cortana language, select a language that works best in your region. Then, hit Yes to confirm that the Cortana language and system region is not matched, and some features may not be available. Open Windows 10 Quick Access menu, and go to Control Panel. Go to Clock, Language and Region. Click or tap on Region to open the Region window. In Location tab, set Home location as United States. In Formats tab, set Format as English (United States). In the Administrative tab, click or tap Change system locale button and set Current system locale to English (United States). Optional （only if above trick doesn’t work): Go back to Clock, Language and Region and select Language. Add English (United States) as a language, and move it to the top to make it the primary language. Restart the computer if applicable. Cortana is ready to be set up and used. Note that you need to sign in to Microsoft Account (MSA) to use Cortana. Cortana works with both keyboard input or voice input through microphone. While changing the region and language of Windows 10 to United States and English (United States) allows you to turn on Cortana, it also means that there is higher chance that Cortana couldn’t understand your pronunciation, especially if you’re non-native speaker. You can improve the Cortana recognition rate by turning on the recognition of non-native accent. To do so, open Windows 10 Settings, go to -> Time & language -> Speech. Under the “Speech language” heading, choose the language you speak with this device from the drop-down list, i.e. English (United States) in this case, and then select the check box for Recognize non-active accents for this language.